Home / Unlabelled / Did Google Waves a Green Flag for the Next Android 5.0 in the Screenshots? Did Google Waves a Green Flag for the Next Android 5.0 in the Screenshots? 10 points to Droid Life for this one. I didn't even notice this. 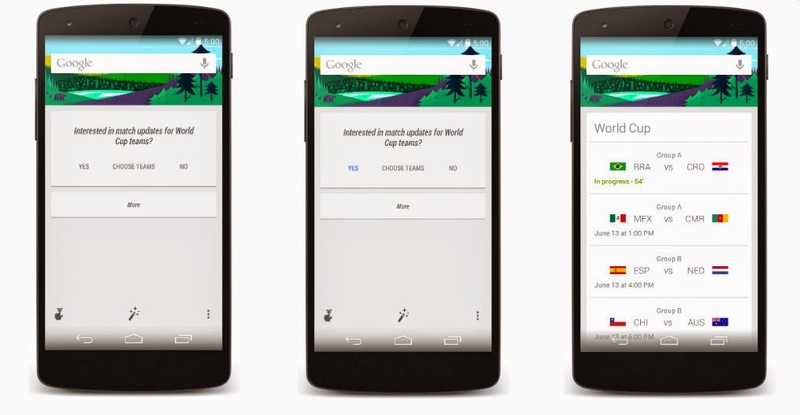 But in the screenshots for Google Now which shows off how to stay updated with the 2014 FIFA World Cup – Google may have teased Android 5.0. I know what you’re thinking, everything looks exactly as it does now, and that’s true. But look at the time. It says 5:00. Now in the past, Google has used 4:00 for ICS, 4:10 for Android 4.1, 4:20 for Android 4.2, 4:30 for Android 4.3 and 4:40 for Android 4.4. So, 5:00 seems like it would be Android 5.0, right? This wouldn't be the first time that Google has done something like this. They updated an app in the Play Store prior to the Android 4.2 release which had 4:20 as the time. So this could be Google getting us hyped up for the Google I/O developers conference in about two weeks, or it could just be Google trolling us, which has also happened before. With Google I/O in just a few weeks, it is possible for us to get a new version of Android, but I don’t think anyone is thinking Android 5.0, I think we are looking at Android 4.5, as the bigger releases usually come in the fall these days. Maybe it’s time we start getting our Android 5.0 wishlist together, or perhaps its too early? In the past, Google has done horribly with keeping secrets. Just look at all the Nexus launches. We basically knew everything about each device before Google announced it. With the Nexus 5 being the most leaked device of all of them. We’re expecting the Nexus 8 at Google I/O and if we do get the Nexus 8 it will be not fair that we don't see the new Android version with that new Tablet. What about the rest of you, what are your thoughts? Let us know in the comments down below.